The Farm – For one hour, on Sunday, July 23, we’re inviting you to tour the new social space in Destiny 2. Starting at 10am Pacific, you’re welcome to kick the ball into the net or befriend a chicken. Most vendors and services will be offline. Our goals are to see how many of you it can accommodate at once. What you won’t find in the Beta is Clan support or character progression (you’ll still receive rewards for defeating your enemies), and your progress from the Beta won’t carry over to the full game. By participating in the Beta, you’ll receive this emblem. 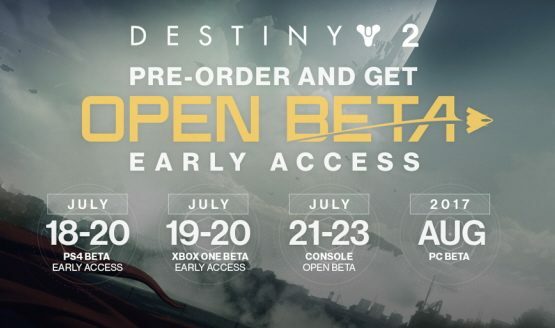 As previously announced, early access to the Destiny 2 Beta begins on July 18 on PlayStation 4 and July 19 on Xbox One for those who have Destiny 2 pre-ordered. The beta will then open up to all players on PS4 and Xbox One from July 21 through July 23. Destiny 2 releases on September 6 for PS4 and Xbox One.